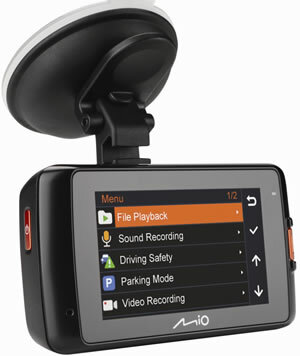 Mio MiVue 608 dashboard camera is the entry-level dash cam from Mio. This dash cam records in Full 1080p HD quality and features a 2.7-inch screen. Not only will this dash cam record continuously whilst driving it also features parked mode that uses motion detection to start recording. Playback video on a HD TV or use the Mio MiVue software to playback on a computer. There is no SD card provided with the Mio 608. This Mio MiVue will accept SD Card up to a capacity of 128GB. Mio MiVue 608 has been discontinued. 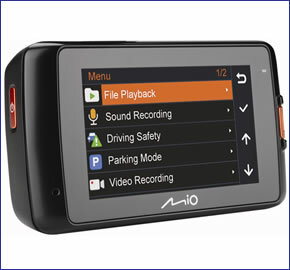 The Mio MiVue 608 is a dash cam which will record in 1080p Full HD quality at a rate 30 frames per second. You can view recorded video on the dash cam device which has a 2.7-inch screen. This Mio dashboard camera also features the latest H.264 technology that ensures the videos are recorded in high quality at a small file size, maximising the storage capacity for the recording of videos. The MiVue 608 will record continuously as you drive. The recording angle of the road ahead is 140 degrees. There is a 5 glass lens which is an F2.0 lens which provides brighter and clearer videos even in low light conditions. In the event of an accident the Mio 608 dash cam senses impacts and ensures the recorded video is saved and cannot be overwritten. The recorded video can then be used as evidence of what happened to cause an accident. This is made possible using the 3-axis G-Sensor. G-Forces experienced are also recorded and stored by the Mio dashboard camera. Parking mode records video using motion detection whilst your vehicle is parked. Videos will be recorded when events happen in front of your vehicle. A second SD card slot is included so you can store a large amount of recorded videos. There is no SD Card provided when purchasing the MiVue 608. The MiVue 608 will accept SD cards up to 128GB. There is also a camera photo mode on the Mio 608 that is useful in the event of an accident whereby you can take photographic evidence in the event of an accident or incident. Watch recorded video on an external monitor or HD TV to view crystal clear HD videos. Also playback video using the Mio MiVue Manager which works with Windows XP, Windows 7/8 and Mac computers. With this software you can control the speed of the playback of videos, view impact force data, see direction of travel, share videos on social media websites (YouTube, Facebook). Do you have a question about the MiVue 608 that's not been answered on this webpage? Please see our Dash Cam FAQ's for questions from other people. If the answer to your question isn't featured, use the online form to ask us for the answer. Alternatively please telephone 01733 777623 Monday to Friday (9:30am-5:00pm) to speak to one of our sales team. The Mio MiVue 608 includes a car charger that you can use to power the in car camera device. A windscreen mounting bracket is also provided. MiVue Manager is a tool for you to view the videos recorded on your MiVue 608 recorder on a PC computer or Mac Computer. The Mio MiVue software can be downloaded from the Mio Service website. Looking for accessories and spares for the Mio MiVue 608? Accessories available to purchase from ActiveGPS include a replacement vehicle power cable, hardwire power cable and USB cable.